Little did I know when I started this website a few years ago how one thing would lead to another. A series of incremental steps led to wartime draughtswoman Stella Rutter having the opportunity to visit the Boultbee, which she knew was only a few miles from her home. 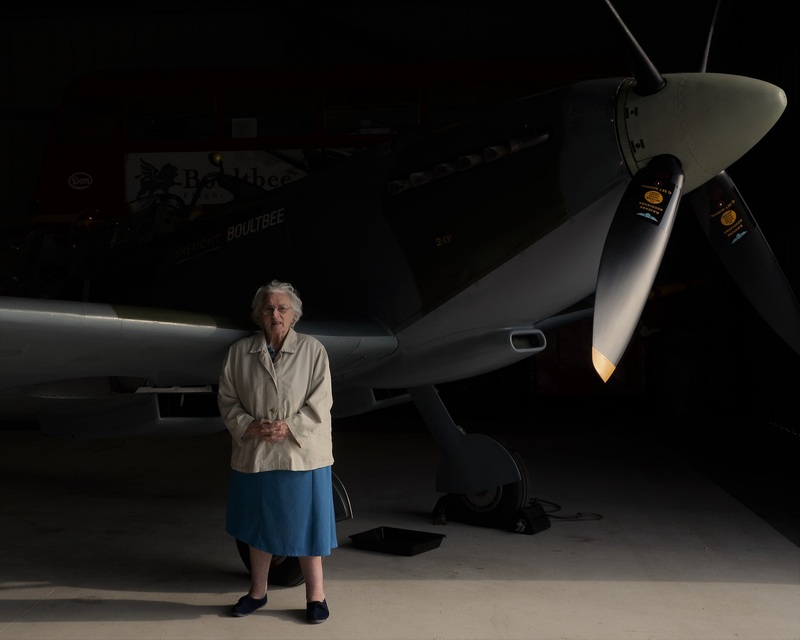 As one of the founding members of the Spitfire Society, Stella has on occasions been to Spitfire events but not to Boultbee. So near yet so far. My initial chance meeting with Stella was at The Spring, Havant, This year Stephen Mosley fulfilled Stella’s wish to visit Boultbee. Go to Stella’s page to read the start of her story. Stephen is writing here under his pen name of Actuarius. He is also an artist from the Futurist school of art, his idol being C. R. W. Nevinson. My thanks to Stephen for his contribution and his kindness to Stella. Anyone wanting to contact Stephen can do so via the Contact page. 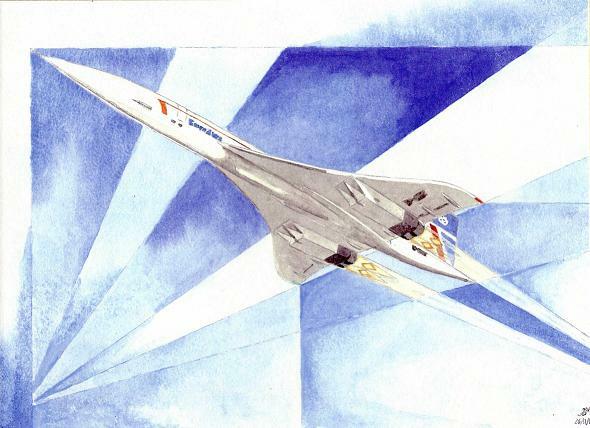 Here then is his story of how the Past met the Present with a Futurist. An Evening with Stella – By Actuarius. The opportunities that come about in life are not always straightforward or predictable. Thus I started with an incomplete group of autographs, personally obtained over 20 years ago, and ended recently via a convoluted process with finally completing the set. At the start of 2017 I made a couple of fairly rash investments through a well-known auction website, both being items related to the Schneider Trophy. This was an early 20th Century air race that ended when Great Britain won it for a third time in succession, in 1931, and therefore got to keep the trophy forever. Having done the deed I thought I ought to research new purchases but both of them proved to be rather difficult to find information on. 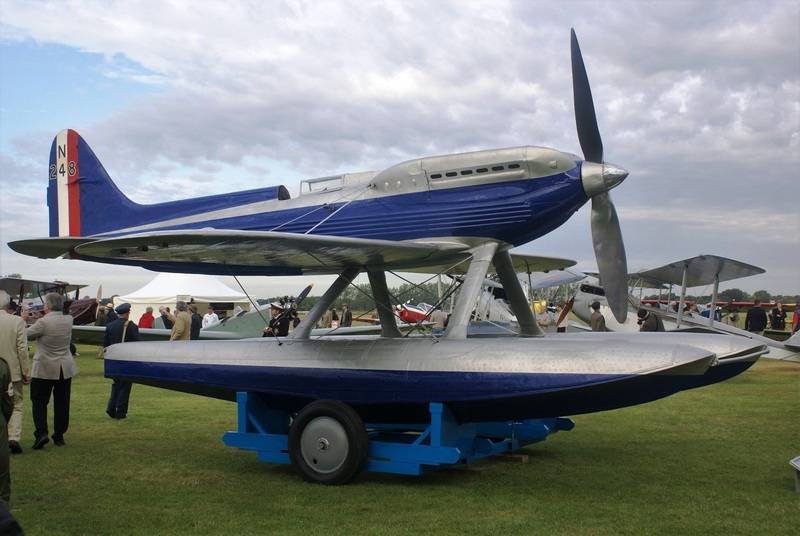 Coincidentally, if anyone knows anything of 1929 commemorative “smoking stands” or the large model of the Supermarine S5 that was on display at Calshot up until the 21st Century, then I would appreciate your getting in touch. 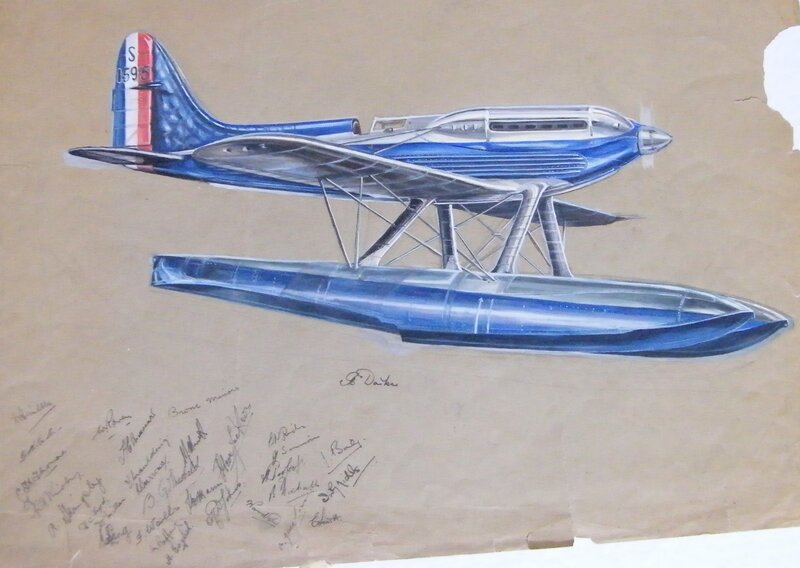 However, it was during this exercise that I stumbled across a painting of an S6 by Concord Morton on the Solent Aviatrix website run by Anne Grant. 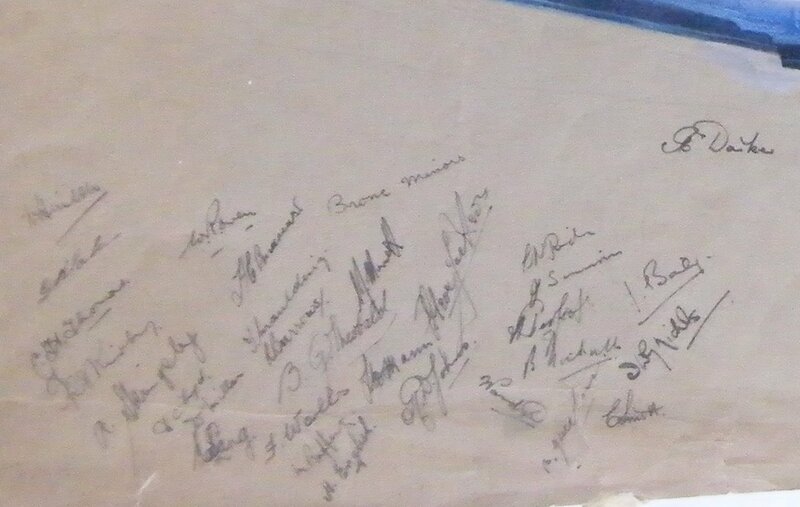 It was chiefly notable for having a number of signatures under the image. The working hypothesis is that these were probably Supermarine staff, possibly those who had an involvement with the actual aircraft. However there was nothing to back this up. 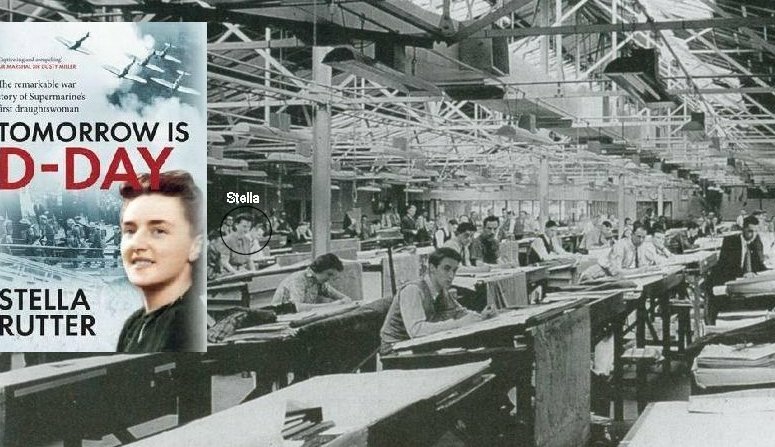 The story now jumps back a couple of decades to 1997 and the presentation of a hand written book, listing the engineering staff at Supermarine who had worked on the Spitfire, to the Solent Sky museum in Southampton. My wife saw an article about it on the morning news and a rapidly arranged afternoon off ensured that I could attend. The staff at Solent Sky were very kind in allowing me to loiter for the price of a standard admission ticket whilst the purchase of a couple of copies of Chaz Bowyer’s “Spitfire” from their shop ensured I had something suitable to collect autographs in. It was an honour to meet the Supermarine staff present, and important to me that these largely unsung heroes and heroines should know the high regard they are held in. Aircrew and ground staff are rightly lauded by all but without the superlative aircraft the engineers provided their efforts would have been for nought. So it was that on 1 March 2017 I headed over and had a very pleasant evening chatting to Stella Rutter. As Stella Broughton she had become the first draughtswoman at Supermarine, transferring to their technical publications department from being a tracer at HMS Excellent on Whale Island in Portsmouth. Stella told me how, when she joined, Supermarine’s design office was located in a hanger in the field at the back of Hursley Park House. The weekday commute was from digs near Winchester and then walking through the formal gardens. Weekends were spent back with her parents in Bedhampton near Portsmouth so Mondays were more trying with a cycle commute to a friend’s at the bottom of Portsdown Hill and then a walk up to the top for the bus. Week in, week out despite blackout regulations, snow or “tip and run” raids by the Luftwaffe – and repeated in the reverse direction every Friday. The dangers and corruption of the everyday under wartime conditions were brought home when she told me how, whilst at Bedhampton, a bomb had exploded just past the end of their garden and the night’s sleep would invariably be interrupted by the sound of mobile anti-aircraft guns being moved up and down the coast. Her move to Supermarine came about due to her father meeting Gerald Gingall, the head of the Technical Publications Department, and suggesting her for a vacant position. She believes her success was down to having inherited a notable ability for drawing from her parents (her father being the Vice Principle of the College of Art in Portsmouth), and from having older brothers meaning she was unperturbed by working in an entirely male environment. In her opinion she gained a mutual respect with the rest of the staff because in attitude she was “as much a man as any of the others”. When other women joined the staff later she found she had to be careful of her approach and activities because she “didn’t wish to end up being ostracised or the subject of malicious gossip.” Such considerations may seem almost unbelievably unenlightened to our modern sensibilities but these were different, and difficult times. Stella worked as part of a small team under Gingall, “ a very stocky man”, virtually exclusively on the Spitfire; and covered all aspects of the aircraft. Their area in the hanger was located next to the obscured “secret section” and because theirs was a small section, and possibly because Stella was something of a novelty, the frequent visitors tended to stop off for a word. Thus Jeffrey Quill, chief test pilot and Joseph Smith, Mitchell’s successor, were known to her. She got on well with her boss and was even chosen to join him at home one evening to work overnight on a drawing that needed to be completed urgently. I asked what it was like to work at Supermarine given the legacy of the S6, after all this was the catalyst for our meeting. She was sure that she’d worked with people who had been involved with the Schneider Trophy aircraft and this was part of what gave them a sense of being the “crème de la creme”. “Let me put it this way”, she confided, “We were the company of the year.” There are further tales of pouring tea for Monty and being involved in a special party before D-Day, but that can wait for another time. As I was leaving she suddenly remembered how, when she was about 8 years old, she had climbed out onto the valley between the two pitches of the roof at her home to watch an aircraft fly up from the Southampton end of the Solent, turn and fly back. Conjecture I know, but the dates match so surely it is not beyond the realms of possibility that I was hearing the first hand account from a witness to that final Schneider Trophy win? Today Stella is bright and articulate but has trouble accessing detailed memories, I suspect this being attributable to the ME she mentions in her excellent autobiography, “Tomorrow is D-Day.” There was so much I wanted to find out about her work and the people she knew but, frustratingly, a lot of these memories remained locked out of reach. Thankfully there is her autobiography, only written a few years ago, and enough still accessible to provide unique insights into her career and her life. Such considerations matter little though when you reflect on the singular honour of sitting and listening to these memories being related in person. 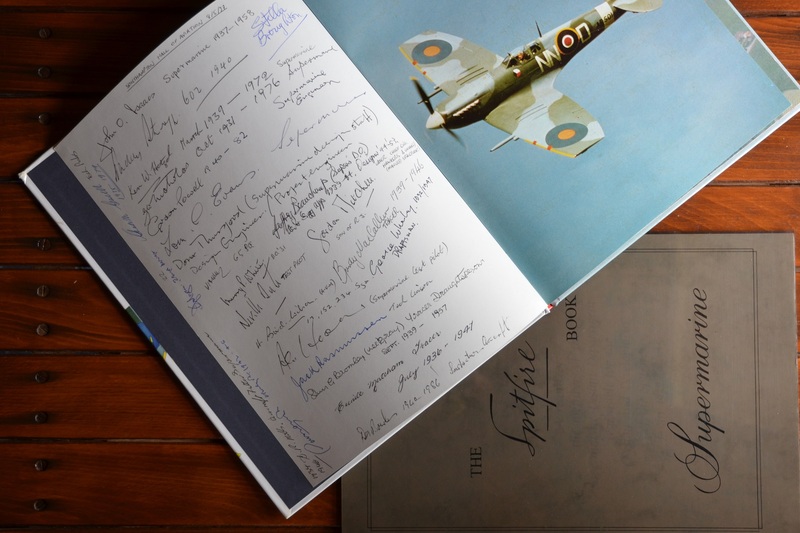 For some reason, although she was present, I’d missed the chance of getting Stella to sign my book in 1997 but her autograph now sits on the page surrounded by those of her colleagues – which is exactly how it should be. 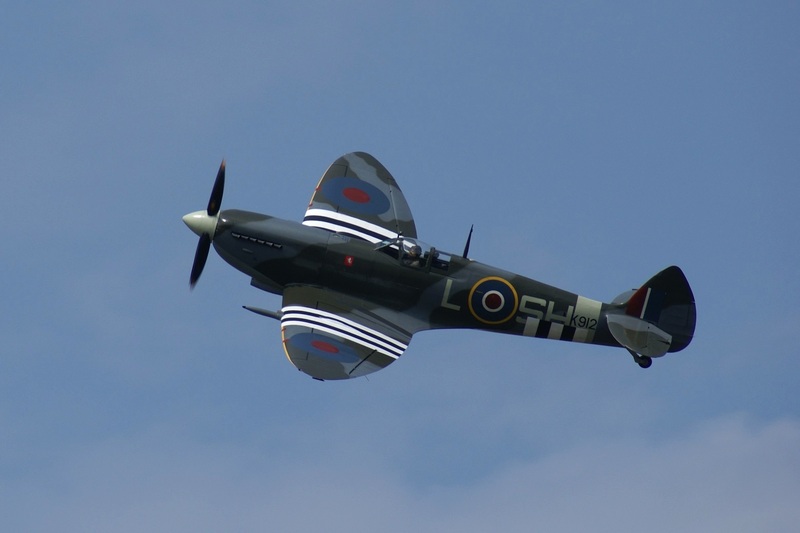 As a postscript, Stella had mentioned how she knew of the Spitfires at the Boultbee Academy just down the road at Goodwood, but that she hadn’t had the chance to go and see them. 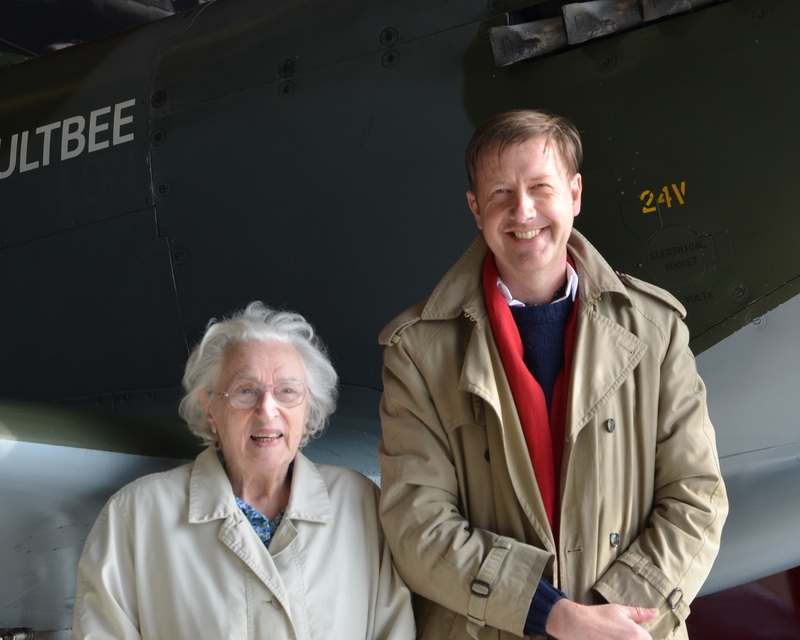 Well, Boultbee are always keen to help reunite veterans with the aircraft, so a month and a half later my wife picked her up and we had a very pleasant hour in the hanger. Our sincere thanks to those who made this possible and who gave up their time for it.